On the heels of their bizarrely slick eleventh album Pacific Daydream, Weezer have announced yet another self-titled record, this one destined to be known as the Black Album, coming in May. (Advice to Rivers Cuomo and the gang: maybe choose lavender or something for the next one to avoid the otherwise inevitable Beatles/Metallica/etc confusion.) Cuomo has been talking about this record for a while—Pacific Daydream was essentially a compilation of Black Album outtakes that made it to the market before the real thing did—but formally announced it in an interview with Zan Rowe of the Australian radio station Double J. 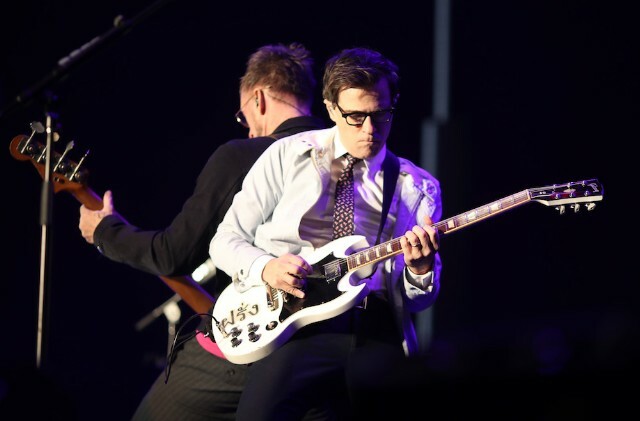 It sounds like fans who were hoping for a return to Weezer’s old guitar-driven sound after the EDM-influenced Pacific Daydream will be disappointed. “Pacific Daydream definitely feels like a step forward, or at least a step in a different direction, compared to the rest of the Weezer catalog,” he continued. “But yeah, the record we were making, and the record we’re finally finishing now, the Black Album, should feel like about 10 steps in some other direction.” He added that the Black Album was intended as a darker counterpart to the White Album, released in 2016. The new album will be coming May 25, according to Cuomo. Hear the full interview here. The Black Album talk starts at about 1:21:45.